Abstract: This thirteenth episode is a celebration of Michael Jackson’s 58th birthday. Karin and Elizabeth’s conversation explores Michael Jackson and Afrocentricity, the predominantly American study of the history of black Africa. They discuss the many ways in which Michael Jackson was aware of, knowledgeable about, and proud of his African-American heritage, and how throughout his career, he gave a strong message in his work about black history in a variety of ways. They also discuss the following eight songs: Bad, Liberian Girl, Remember the Time, Jam, Black or White, Keep the Faith, They Don’t Care About Us, History. Merx, Karin, and Elizabeth Amisu. 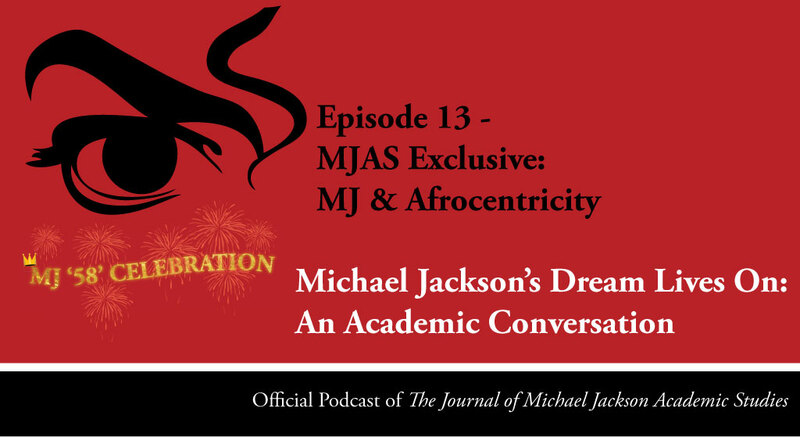 “Episode 13 – MJAS Exclusive: Michael Jackson 58th Birthday: MJ & Afrocentricity.” Podcast, Michael Jackson’s Dream Lives On: An Academic Conversation 3, no. 1 (2016). Published electronically 29/08/16. http://michaeljacksonstudies.org/episode-13/. Michael is descended from the people of the Ivory Coast. He is King Sanwi. 2) Elizabeth Amisu, “‘Bad (1987)’.”The Journal of Michael Jackson Academic Studies 1, no. 2 (2014). Published electronically 22/7/14. http://michaeljacksonstudies.org/bad-1987-2/. 3) Martin Scorsese, film director. 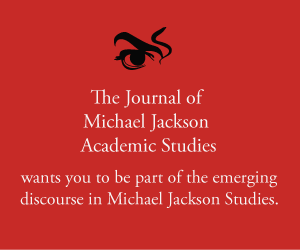 4) Elizabeth Amisu, “‘Crack Music’: Michael Jackson’s ‘Invincible’.” The Journal of Michael Jackson Academic Studies 1, no. 2 (2015). http://michaeljacksonstudies.org/elizabeth-amisu-crack-music-michael-jacksons-invincible/. 5) Toni Morrison, Playing in the Dark: Whiteness and the Literary Imagination (Harvard University Press 1992). 6) Harriet Manning, Michael Jackson and the Blackface Mask (Ashgate, 1st edition 2016). 7) Margo Jefferson, On Michael Jackson (Vintage Books 2007). 9) Michael Jackson’s Dream Lives On: An Academic Conversation, Episode 10 (25/6/16): MJAS Exclusive: 7 Albums, 7 Songs, 7 Years (With Dr. Joe Vogel). 10) Spike Lee, Bad 25 Documentary (2012). 11) Harvey Young, Theatre and Race (Palgrave Macmillan, 2013). 13) BBC World Service, Michael Jackson – The Thrill Of Thriller (2012). 14) Susan Fast, Dangerous (Bloomsbury 2014). 15) Elizabeth Amisu, Certified Dangerous Online Video Course (2016). 16) Michael Jackson’s Dream Lives On: An Academic Conversation, Episode 1 (29/6/15): Was Michael Jackson an Artist?. Hazel Bryan and Elizabeth Eckford, Little Rock, Arkansas, September 1957. © Photograph by Will Counts/Indiana University Archives. 18) Information about the Black Panther Party. 19) Elizabeth Amisu, Certified Beyoncé in Culture Online Video Course (2016). 20) Armond White, ‘How Deep is Your Afrocentricity? Ask Michael and Iman’, Keep Moving: The Michael Jackson Chronicles, (Resistance Works, 2009), chapter 5, p.34. 22) Information about Ben Jonson. 23) Armond White, Keep Moving: The Michael Jackson Chronicles, p.36. 24) Information about Song of the Goat Theatre & Songs of Lear. 25) Smooth Criminal played by 2Cellos. 26) Prison version of Michael Jackson’s They Don’t Care About Us. 27) Mass Incarceration, Visualized, Video by The Atlantic, Sep 11, 2015.